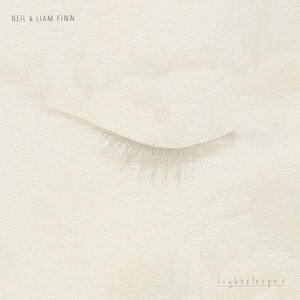 Kiwi pop royalty, Neil and Liam Finn as well as other assorted Finns over-indulge themselves on Lightsleeper. For Neil Finn, music has always been a family affair. He got his start by joining his brother Tim in Split Enz. Later, Tim returned the favor in Crowded House. The pair have also released albums under the Finn Brothers name, while Neil and his wife Sharon formed Pajama Club. Over the last decade, Finn's two grown sons have participated in various of his musical projects and released music on their own. In that sense, this father-son collaboration with elder son Liam is hardly a surprise. Neither should it be a surprise that Sharon, younger son Elroy, and various other Finns make contributions. It all adds up to a cozy, intimate feel for Lightsleeper, not unlike that of Neil's 2017 Out of Silence album, which was recorded live with a chorus of family and friends. Finn, the father, is welcome to indulge himself in whatever sort of project he wishes these days. He has earned the right over a 40-year career that has seen him not only command two major commercial and critical forces in Split Enz and Crowded House, but also earn respect and collaborations from scores of peers from Sheryl Crow to Eddie Vedder. Most recently and strangely, Neil became a member of Fleetwood Mac, tapped along with Mike Campbell to help replace Lindsey Buckingham. The move raised more than a few eyebrows because at this point in the Mac's career it actually seemed a step down for him. It is difficult, therefore, to get too worked up about the fact Lightsleeper is really more of an indulgence than an album proper. That fact presents itself no later than the second track. "Meet Me in the Air" features writing credits and performances from the whole Finn family. It starts off as a woozy mid-tempo soundbed, lazily moving along with analog synth sweeps, and then goes exactly nowhere from there, drifting away as inconspicuously as it began. The song, like Lightsleeper as a whole, is a reminder that for the last couple decades Neil has had an uneasy relationship with his reputation for earnestness and sweet melody. Call it "McCartney syndrome", but it has led him to steer away from his strengths at times, an approach that is laudable but also can lead to frustration. Unfortunately, on Lightsleeper it's mostly the latter. Liam, whose solo work has always been more eccentric, is a natural collaborator, then, but too often the two Finns sound like they are doing little more than noodling around in the studio with longtime co-producer Tchad Blake. "Where's My Room" is the prime example, a meandering collage of drum machines and guitar bits that eventually turns into a sting-abetted, slo-mo disco track. The overall vibe is, frankly, more drunk than funk. The likes of "Hiding Place" and "Hold Her Close" are more somnolent and dreamy, while "We Know What It Means" throws in a lounge-shark piano solo just for fun. Or, at least, one imagines that was the idea. But any intended playfulness or whimsy is lost because the Finns (whose voices are nearly indistinguishable) sing most everything in their ultra-sincere croon and ultimately don't have much interest in turning the focus away from their own navels. It is not a surprise, then, that the parts of Lightsleeper that bear repeated listening are those which embrace more of the arrangements and song structures Neil made his name with. Interestingly, they are both individually written. Liam's "Anger Plays a Part" is an agreeably simple, acoustic-led relationship song with a nice little repeated riff at the end. Neil's "Listen" is a naked, rain-washed piano ballad and is absolutely stunning, one of the best things he has done in decades. Crucially, these songs employ atmosphere in service of overarching emotion rather than for its own sake or amusement. "Back to Life" almost reaches the same fruition. The words are vintage Finn: "Your voice is commanding / And I am loyal to the cause", but they are delivered and repeated in a manner which grates when it shouldn't. Blake, as is his wont, adds bits of drum machines, sound effects, and kitchen-sink type percussion which in this case serve only to heighten the feeling of artifice. With a predictability that is somehow disappointing, Mick Fleetwood shows up on the credit list, apparently playing drums, though it is difficult to tell he's there. The Finns have earned every right to make an album like Lightsleeper, no question. But that doesn't mean you have to like it.